Thor's Well in Oregon looks a lot scarier than it is. Nonetheless, it's still quite majestic. At high tide, it looks like the Pacific Ocean is draining into a circular hole in the middle of Cape Perpetua, just south of Yachats, Ore. 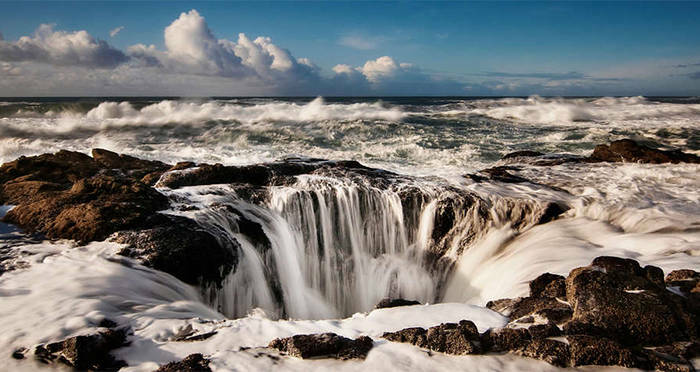 The bubbling water falling into a seemingly bottomless hole has led some to call it “the drainpipe of the Pacific” or even “the gate to hell.” But most know it as Thor’s Well. Although it looks like a violent sinkhole sucking in the entire ocean, its true form is actually much less sinister. In reality, it is a hole in a rock formation that’s only about 20 feet deep. It was likely formed after years of waves crashing down on the same spot, causing erosion which eventually prompted the rock to collapse inward to form a sea cave. When the hole is full, the water fizzles all the way to the top, creating a violent spray that bubbles over the rocks. The water then drains back into the hole. It is constantly overflowing and refilling itself, giving it the appearance that the Pacific Ocean is forever being swallowed by the sinkhole. The ocean pressure and the wind contribute to the majestic geyser-like ocean sprays. Visitors are warned that winter storms in particular are known to agitate the waters around Thor’s Well. However, although the draining and refilling of the hole looks dangerous, ocean experts say it is no more so than any other part of the Oregon coast. 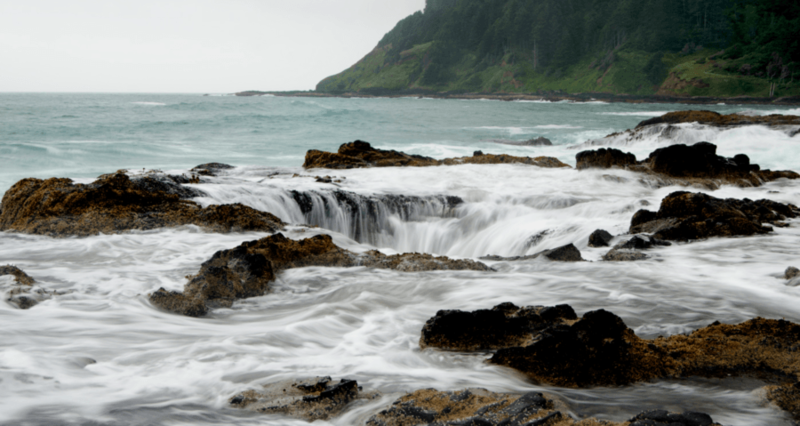 At high tide, there is always a risk of a strong undertow pulling someone out to sea, and the sharp rocks and edges that surround Thor’s Well would make falling in an especially unpleasant experience. Of course, should someone be unlucky enough to fall into the hole, there is a slim chance they would be able to climb the 20 feet back out through the water and slippery rocks. At low tide when the waves are not quite so fierce, Thor’s Well is calm, which is why locals recommend thrill-seeking tourists who want to see the well at its most impressive visit the location between one hour before high tide and one hour after. Devil’s Churn, another dubiously-named attraction in Cape Perpetua, is an inlet that has been carved into the rock over many thousands of years. It too, is a rock formation that eventually collapsed in on itself. As a result, the water can spray up hundreds of feet into the air at high tide. Sprouting Horn is another nearby natural attraction that arose near Cape Perpetua over a long period of time. A cave that developed along the coast, water and air gets funneled into the open space, building up pressure inside the cave. Once the pressure gets to be too much, the water spurts out, creating an ocean geyser that explodes upward at high tide, creating a mesmerizing view. Maybe it’s something about the nature of the area, but this particular part of the Oregon coast has more than its fair share of ocean attractions. In fact, it’s become such a popular attraction that the coast has been named one of the Seven Wonders of Oregon. It draws thousands of visitors each year who come to take pictures and admire the beautiful natural scenery. Next, check out the mysterious sounds scientists found at the bottom of the ocean. Then, take a look at the racist origins of Oregon.